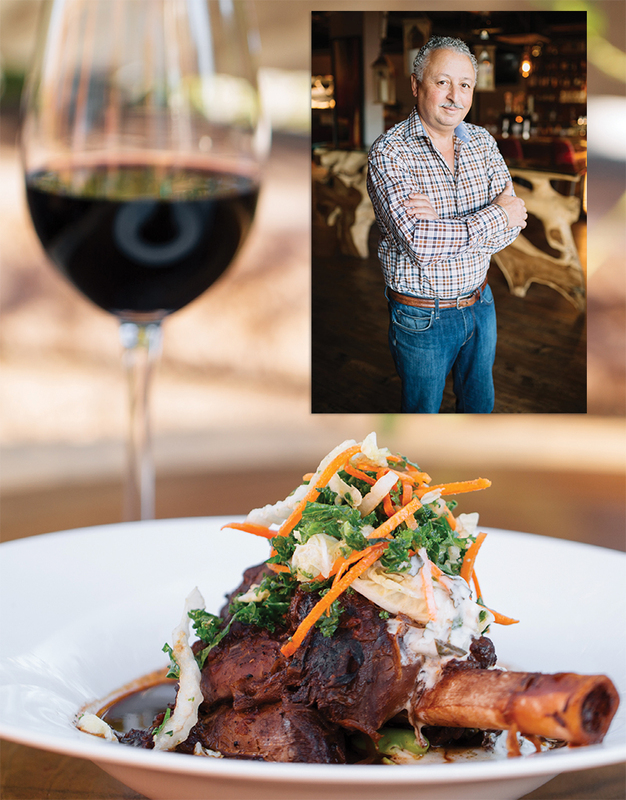 Owner Youssef Amrani (inset) brings the flavors of his Moroccan homeland to Boca. Among the North African and Mediterranean menu items are a braised lamb shank with fava beans, shaved fennel, carrots, and tzatziki. The Drawback: The calamari tagine could’ve used more seasoning. It’s a misty evening as we approach Boca, a tapas restaurant and bar tucked into the side of Hickory’s historic Moretz Mills. The sun umbrellas have been tied shut, with café lights strung across the outdoor terrace glowing in the chilly air. Inside, we are greeted with warm paneling, cozy tartan-covered booths, and striking wood surfaces. A mix of atomic-age chandeliers and oversized Edison-bulb pendant lamps provides focal accents— above the guanacaste wood-topped bar, a corner table near the wine storage room, and at other strategic points of the varied seating areas. The décor is subtly stylish, warm and inviting, with hints of the exotic, like embroidered leather wall hangings and red-pattered latticework. The menu pulls from a number of national cuisines, but mainly from the Moroccan homeland of owner Youssef Amrani along with Spain and Greece. As is au courant, the menu boasts many small plates, as well as a decent selection of heartier fare. Amrani, who has co-owned several restaurants in Hickory, enlisted young executive chef Taylor Fisher to execute his vision. Boca is also known for its cocktails, and the bar is helmed by James Vinson. He maintains a list of seasonal beverages, but our server assures us that even better would be for us to mention a spirit we like, and Vinson will concoct a special libation just for us. Being that it’s a bit of a wintry night, I select the on-menu Midnight Stroll, which melds Ezra Brooks bourbon, a hint of sweet vermouth, Campari, and crème de cacao on the rocks in a cut crystal high-ball glass. It’s a dusky shade of rose and not as sweet as one might expect, readying the palate for the more savory plates we’ll order. Appetizers like the Anchoas (left), bites of anchovies cured in olive oil and lemon juice and served on a baguette with tomato fresco, and Piquillos (right), peppers stuffed with goat cheese, can be enjoyed with a craft cocktail, including the bourbon-based Midnight Stroll. Eggplant roulade satisfies our immediate urge for a warming comfort dish. Sliced thin, the vegetable has been lightly fried then rolled with warm herbed ricotta. The richness is foiled by a cloak of rustic marinara. The appetizer described as naan, a nod to Indian cuisine, could really be any golden buttery lavash-style bread ready for ripping and dipping. Baba ghanoush (roasted eggplant, tahini, olive oil, and herbs), hummus, and tzatziki compose the trio of dips. Again, the eggplant wins out. Rather than cloyingly smoky or bitter, a superior roasted flavor emerges foremost. Hummus is hummus, but enjoyable as ever in its rusticity. Just the tzatziki—while tasty in its garlicky, cucumbery, minty essence—has a too-liquidy consistency, like a sauce meant to be poured onto a falafel or gyro. 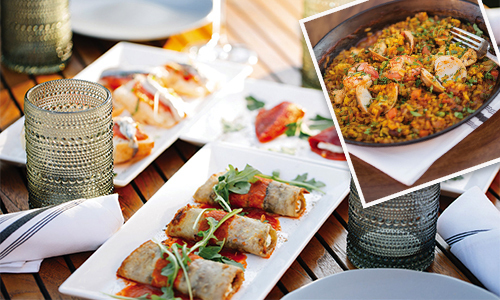 We venture on towards the larger tapas and mains. Between chicken and calamari tagine, we choose the latter stew. But I’m sad we aren’t served the entire earthenware pot in which it is cooked (and after which it’s named). The conically shaped dish can be very pretty—some have intricate designs—and are primarily used to slow-cook savory stews and vegetable dishes, as the lid of the tagine traps steam and returns the condensed liquid to the pot. For its part, the calamari, in a savory broth, would profit from the addition of vegetables. We wonder about the anchoas—a nod to Spanish tapas, with anchovies cured in olive oil and lemon juice served on baguette with fresh tomato. Or the beef kebab, which, while perhaps pedestrian-sounding, includes couscous salad and harissa, the spicy and aromatic chili paste that’s a staple in North African and Middle Eastern cooking. More typical versions include hot chili peppers, garlic, olive oil, and spices like cumin, coriander, caraway, and mint. The lamb shank proves to be the star of the evening. Braised in a luscious, richly spiced au jus, nuanced with subtle hints of cinnamon, sage, and shaved fennel atop, it will convert even nonlamb lovers. Tender green fava beans and carrots round out the balanced, wintry dish. Piquillos (goat cheese-stuffed peppers), the charcuterie board, and rabbit sausage served with white beans and aioli might be menu choices for us next time, as clearly Boca is a place locals visit frequently for its variety. A table of fashionable young women in for drinks after work grows jovial with the second serving of cocktails, along with racks of tacos and plates of roasted cauliflower and Brussels sprouts. Surprisingly, mid-week date night is in full swing here, and several tables of professionals still in suits fill the dining room by 7 p.m.
To conclude our experience, we listen to the desserts recited by our friendly server. The selections sound fairly typically American, but most are made in-house. A limoncello torte veritably floats to the table. The delicate sponge melts in the mouth, while the light-as-mousse citrus icing cleanses the palate and concludes a truly fun meal that hit many high points. 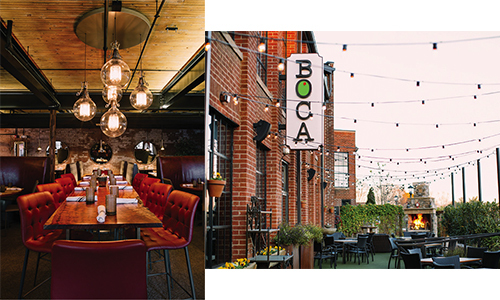 Overall, it’s clear that Boca provides a fantastically flavorful and stylish option amid Hickory’s dining and cocktail scene.